M.A.FORD Archives - ตัวแทนจัดหา อุปกรณ์ เครื่องมือ และเครื่องจักร ในงานอุตสาหกรรม | Factory Max Co., Ltd.
innovation, quality and professional service. 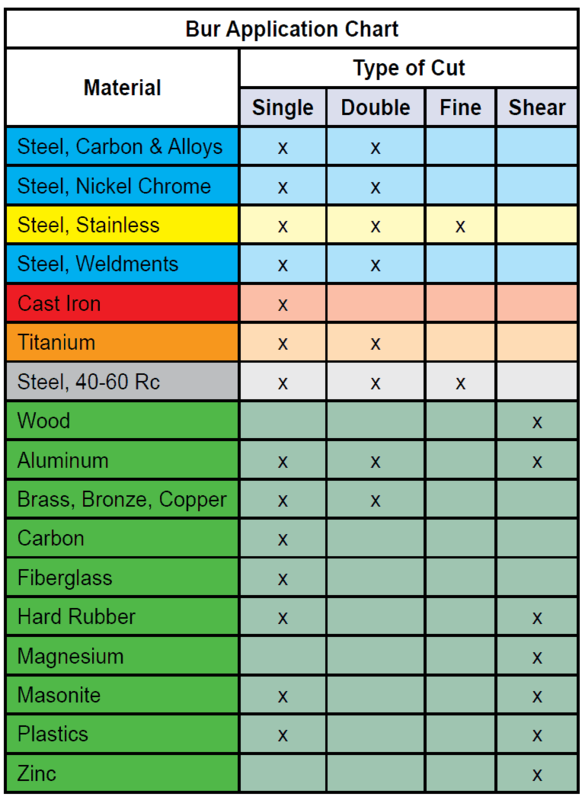 Following are general guidelines for selecting the correct bur based upon material being machined. A general-purpose right hand flute style is recommended when rapid stock removal and good workpiece finish are the parameters. less stock, with more operator control. A right hand flute style bur is recommended for rapid stock removal on softer, non-ferrous and non-metallic materials. Diamond style. An alternate diamond grind has left hand fluting added to standard or fine cut fluting. produce small or sliver-type chips. A slight left hand cutting action typically provides the operator more control of the bur and grinder. Diamond grind is left hand fluting added to single or fine cut burs. Like an alternate diamond grind, a diamond grind will also break up bothersome chips into an almost granular powder. More precise deburring is possible because of a more balanced left and right hand cutting action. The most rapid penetration achieved with a carbide bur is with diamond grind. A diamond grind will, however, reduce tool life. Recommended for ferrous and stainless steel materials.